Back in June last year the former National government and the council signed the terms of reference for the project. One of the clear goals of the project is about using pricing as a demand management tool rather than a revenue raising tool. This doesn’t mean it won’t raise revenue but that’s not the primary purpose and the and the terms of reference even require that using it to replace existing road taxes in Auckland. Now the first of three planned reports has been released. It appears this was actually finished in November last year but is only being released now it’s being presented to the Council’s Planning Committee next week. Surprising to no-one, it confirms that Auckland is congested and is likely to be more so in the future as the city continues to grow. For the most part, much of this first report is just an update of some of the work done as part of ATAP. For example, some updated numbers and modelling on the impact of congestion. One of the more interesting graphs is this showing the the proportion of arterial roads subject to congested conditions. One of the things you can see is that the numbers have plateaued recently, something they attribute to the opening of Waterview. They also say they think the trend will resume again as demand continues to grow. From my read through of the document, and discussion with some of the project team, I can’t help but wonder if they’re taking the wrong approach in some areas. Here are a few examples. Much like with ATAP, this first report is only really about setting the scene. One of the first things to note is that the project, or at least the report, has been renamed. It was previously known as “Smarter Transport Pricing” but has been renamed to “The Congestion Question“. Within the document, it often refers to everything as Congestion Pricing. I think this, and the overall name is an odd choice given that the ultimate goal is meant to be about demand management. Given how much of a hot topic taxes tend to be, it feels like they’re unnecessarily setting themselves up for bad press on the word pricing rather than what it’s meant to achieve. I also worry it might set up a false expectation that as a result of pricing, roads will be completely free flowing all the time, which is unlikely to be the case. I get the feeling that the team are focusing on some of the wrong metrics. For example, the footnote the graph above states “Congestion is defined here as average travel speeds of less than 50 percent of the posted speed“. The next graph also focuses on speed. It’s natural to want to travel as fast as the signs say you are allowed to, but that doesn’t mean we should be designing our transport system to enable that 24/7. To do so would be both hugely expensive and destructive. Instead the focus should be on throughput and travel time reliability. In other words, you may still travel slower than off-peak but it’s not going to be 40 minutes one day and 1.5 hours the next. Along with some of the updated numbers, the other key, and new part of this report is a number of case studies from other cities around the world. The main report features ones from Stockholm and Gothenburg, Singapore and London but a more detailed report from consultants also released details a number of others. They also say why they think Auckland is different to those cities. No ‘New World’ city with dispersed trip patterns and relatively low density of housing has yet introduced congestion pricing. The widespread nature of Auckland’s congestion means that schemes that have worked well elsewhere may not be as effective in improving congestion across Auckland. Auckland’s geography, urban form, trip patterns, and governance require bespoke policies, public involvement, design and delivery that build incrementally to address the most widely acknowledged challenges. One of the major differences between Auckland and cities that currently have some form of road pricing is the availability and use of alternatives. As such, I think one of those issues that will need to be investigated is at what point we have sufficient alternatives, and capacity to driving for most people. Let’s say we were to introduce road pricing right now and if it caused a 20% increase in PT demand, the system simply wouldn’t be able to cope. I think getting most of the strategic level rapid transport network in place should be one of those requirements. ATAP did look at various pricing options and recommended a whole network based solution but this study is intended to go back and look at all options again. At a high level there four options but a final solution may include a combination of them. The next stage of the project will create a list of potential options for the Auckland context and then narrow them down. This phase is expected to be complete in August. The 3rd phase is intended on narrowing that list down further to one recommended option. There’ no date on when that will be delivered yet, but I’m told it’s likely in some time in 2019. Given how hard it’s likely to be to get public support, despite already some political support, I hope by then they’re able to present a compelling narrative. Getting the communications right on this might be half the battle. Auckland University business school has a talk on road pricing 19 March. Report finished in Nov and released in Feb. No sense of appropriate urgency. The basic computer software that identifies number plates and links to the national rego database needs to be written now – so charges for congestion / parking / speeding can be tied to vehicle rego. With that in place specifics of how to implement a congestion charge for a specific city would be much easier implement. Bob, I don’t think there’s any urgency at all. We’re a long way from having universal access to frequent public transport in Auckland and we’re moving forward at a snail’s pace. Also, as outlined in the detailed report, congestion pricing has proven to be deeply unpopular in many of the cities that have tried it, and some are now stepping away from it. I have the feeling that the whole idea may be dead in the water as far as we’re concerned. We need to find a bigger and better way to fund the step change in public transport that Auckland needs, because it’s hard to see how rates increases, steeper fares and congestion charging will get us there. Urgency needs to come once our PT network can handle any increased demand that results from congestion pricing. I believe we are still a way off from this. In terms of technology (software), look at the northern gateway toll gate, tauranga motorway toll gate for examples where it already exists and is in operation at the moment. Northern gateway toll has a very high administrative cost. Are you saying when I go to renew my rego I am charged extra for outstanding tolls? It certainly doesn’t seem to keep track of speeding fines. My argument is for a central software module with appropriate security controls that applies all fines, tolls and outstanding HP costs to the vehicle and requires appropriate payment when renewing rego or transferring ownership. Once this exists then plug-in in various congestion charges would be simple and inexpensive (think of how TradeMe evolved). It would permit a ‘friendly’ congestion charge – think of a smart phone app that tells you crossing the bridge will half in cost in 30 minutes or even giving you a small refund when crossing at midnight. Maybe Auckland will find charging a local fuel tax a better solution than a congestion charge but lets experiment. Local fuel tax may be unsuitable to Tauranga or Wellington. That is why the government needs to give this issue some priority. What I’m saying is the technology and the software is there, just needs to be implimented in the manner you describe. As to fines, I believe these are currently associated with your vehicle registration, and any outstanding money owing is highlighted in Vechile pre-purchase reports. But my main point is that in terms of congestion charging this can be ready to go by tomorrow using the technology and software we already have. This is not on the critical path, and we need to focus on the items that are on the critical path. Josh: I think we are on the same page. Most of what is needed does exist – I’m troubled that it maybe piecemeal. Certainly not impressed by Northern Toll’s admin costs and the interface with booths at inconvenient laybys. My point is about the central computer software – getting a nicely polished system together costs time and money. It is crazy to re-invent the wheel for each system. When it comes to congestion the government seems to leave matters to local authorities so I suspect they are doing nothing and have little incentive to bring things up to date. For example last family speeding ticket arrived by post a fortnight after the event – we then debated who was driving which vehicle at that time; at least we can now pay online – used to be find a WestPac). Slow and expensive. Should be email the same day and if like some friends of mine who never pay it ought to be added to the charge when the rego is paid not expensively chased up when they try to take a foreign holiday years later. I agree you are right about the actual number-plate detectors – both hardware and software exist and ought to be fairly trivial to erect whether needed. Then we need a specification for congestion charge software that covers all the various possibilities. 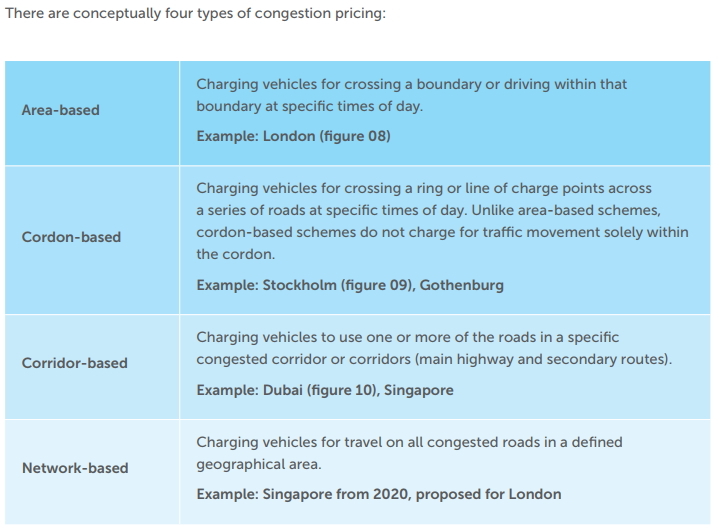 Discussing the four types of congestion charging can come later – try one and if it doesn’t work just try another – just don’t waste time on delaying reports. “most widely acknowledged challenges” – do they mean the public’s perceptions? Wouldn’t “challenges” have sufficed there? It is great they are taking a step back with this. ATAP gave it a once over lightly and recommended a system that doesn’t yet exist. In effect that prevents us from getting a cordon system based on existing technology that would work well. I reckon congestion charging is a classic example of elite projection – rich white men assuming that everyone wants to pay lots of money to be able to get around faster. Maybe there are a lot of people happy with congested affordable roads? WoW, way to try and make a topic that has nothing to do with race, about race. Considering there is money maybe you could try make it about wealth but even that is a stretch considering the income is to be spent improving more affordable transport options. I would imagine that people living in south and west Auckland will be massively worse off under congestion charging as those motorways are quite congested and the PT is mostly bad. Except of course richer people that will have a nice quick drive to work. I’m picking it is going to affect some races much more than others. There is no plan to spend the money on improving other transport options, it will be used to decrease fuel tax. South and West Auckland have the best existing coverage of the rapid transit network so not sure why they would be worse off. East and NW would probably be worst off at the moment, so I don’t think congestion charging is viable without the Eastern busway and NW light-rail. I still struggle to see how this affects you dependant on your race. As mentioned above, I only believe this should be implimented when our PT network is able to provide the coverage and capacity. However if the money is going to improve the PT links to south and west, would this satisfy you? As I say, this provides more affordable transport to these areas you are talking about. Private Vechicle transport is very expensive when taking into account all the costs. That’s a massive over-simplification. Rich people who continue to drive will be better off, but they’re certainly not the only ones: there’s also everyone who currently uses public transport, everyone who currently walks and bikes, everyone that switches to these modes due to the improvements that congestion pricing would bring, and the general population through lower overall transport system costs and externalities (pollution,crashes, noise, amenity…). Poor people who can’t change modes or travel times could end up worse off than they are now, but there are possibilities for addressing that e.g targetted discounts, exemptions etc. Yep if they get our PT system up to scratch before congestion charging then all good. That’s at least 30 years away according to current plans. Or if they spend the charges on PT that would be good – but the current plans are to offset fuel tax. This gets to the heart of the matter, and the urgency. When there are so many imperatives to establish a good PT network and safe environment – climate change, public health, road deaths, pedestrians being hit every day, equitable access, air and water pollution, sprawl, why the dickens are we fiddling and not providing a direct tax stream to do so? They could get it up to scratch much sooner however. The problem areas are North West and the Dominion Road / Mt Eden Road of transport doom. Sort these area’s, add capacity with more trains and buses and we are ready for congestion charging. It is inevitable that anything that uses price to manage demand will be more easily available to those with more money. However, with a quality PT system running in parallel everyone can benefit, especially if it is funded by congestion charges. There may well be a number of less well off people that are big supporters of congestion charging. If they travel off-peak then their costs are likely to be much less than they currently are with fuel tax. I do agree though, everyone will have different opinion of how much they are willing to pay to reduce congestion. I’d be willing to pay a significant sum to be able to leave Auckland on a Friday afternoon doing 80kmh, but someone else may only be happy to pay half of that to ensure traffic flows at 50kmh. This will be the biggest battle in terms of getting buy-in to congestion charging. 100% agree. How do you set a price that suits the senior office worker with carpark and the cleaner. Well obviously the goal is to get the cleaner off the road otherwise what is the point. I think it’s the worst form of phoney capitalism- taking an asset that is highly subsidised by everyone in terms of cost, land use and pollution, and reserving it for the well off by charging an amount that doesn’t cover the true cost, but excludes poor people. I find it quite repulsive. I’ve always felt the same about toll roads. I’m going to have to reconsider road pricing as a “mechanism”. Reality is, if we’re needing such a mechanism, what else are we not doing? You could fully compensate low income people by giving them the cash equivalent of what it would cost to use the road. If they choose to drive then they get a massive benefit from reduced congestion at no net cost. If they choose not to drive they pocket the money and are better off. If we choose to do so we can compensate those deemed worst affected without affecting the overall effectiveness of the scheme. Matthew, possibly there are mechanisms. But just taking your idea a little further, would this just be for the poor people who are separated from the cbd by a road-pricing mechanism? Would they receive it whether or not they need to come into town for work? If so, those lucky enough to have found a local job will get a bonus. If not, would those not working in town but needing to travel via the priced roading network regularly for another purpose miss out? Jimbo, what ideas do you have to provide mechanisms to encourage behaviour change without creating more inequity? It’s worth remembering the cleaner who does night shift and drives out of peak hour already pays a significant amount of tax and at the same flat rate as everyone else who drives. Congestion charging would be a significant benefit to this person if it replaced existing fuel taxes as they would likely pay much less. If they had to travel during peak they would likely be priced off the road, which is why quality PT is important, in fact it may well be much better than the current battle with congested traffic. There would be additional benefits for everyone in that goods and services will likely cost less if trucks and plumbers are not stuck in traffic. Heidi I guess the devil is in the detail. For example if the congestion charge only applies to the CBD I’m not so concerned. Wages would probably just go up to compensate and if not people probably have other job options. But I’m not sure that would help general congestion that much. Congestion charging is effectively the stick forcing people into PT. I prefer the carrot to the stick – make PT so attractive that people don’t want to drive. Jezza yes I agree if there is a good PT option. But let’s face it, for most people in Auckland their isn’t. For example my 12 km commute takes 25 min by car and 60 min by buses. You would need to charge a fortune for me to give up 70 mins of my time per day. But a poorer person would just have to. Yes off peak travel would benefit from congestion charge but the majority of people work during peak hours. You must acknowledge that congestion charging is all about getting poor people off the roads so rich people can drive fast, right? I disagree that it is as simple as that. That’s like claiming that charging a price for bread is all about getting poor people out of the supermarket so rich people don’t have to wait in line at the checkout. Nick I think the bread example isn’t that similar. Keep in mind we are talking about roads and land that are publicly owned. Also we are talking about a congestion charge that doesn’t cover the full cost by any means. Imagine we took it to the extreme and made the charge so high that only the extreme rich could afford. Would you be happy knowing that publicly owned subsidised roads and land were being reserved for the extreme rich? Would you be happy knowing that publicly owned subsidised roads and land were being reserved for the extreme rich? – yes, if they were paying for a free, good quality, public transport and cycleway system. I thought the proposal was for the congestion charge to replace fuel taxes, such that it basically would cover the full cost? Pricing it so high that only the extreme rich could afford it wouldn’t work, there wouldn’t be enough revenue. What full cost would that be, Nick? The full cost would indeed require a very high price that only the very rich could afford. Well the full direct cost in terms of replacing petrol taxes, if not the real full cost. But there’s heaps of things that are publically subsidised which also have a charge to use e.g. bus fares, train fares, parking fees, museums, stadiums, venues, electricity, water… Do you find all these charges repulsive? I don’t have a problem with any of these. If people can’t afford them you can look at discounts, rates rebates, higher benefits – these are all more efficient than just getting rid of charges and creating all kinds of perverse incentives for people to do inefficient things. chrism I think the main purpose for the charge on those items is to reduce the amount of subsidisation. In the case of congestion charging the sole purpose is to prevent certain people from using the service that they already subsidise. I would be equally repulsed if water was $10/litre in peak times, or the health system put a $5000 charge on operations to reduce its waiting list. 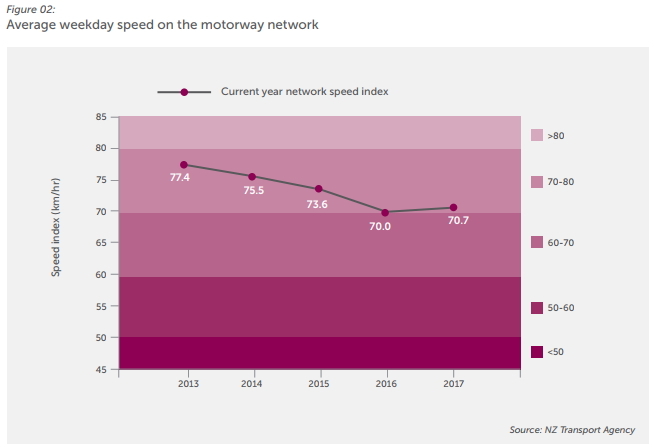 That average motorway speed graph is particularly useless as you say. With many areas now permanent 80km/h zones, 70km/h is not that bad. But if you add the Northwestern where everyone seems to drive at 110km/h in spite of the 80km’h signs, that will surely mess with numbers (albeit with the other side of the motorway at 10km/h). Yes we need our PT network rolled out now. I was abused the other day while on my bike, negotiating a busy road, rather safely. I resisted the urge to explain to the driver that his position as a car stuck in traffic is defenseless. He is part of what he creates. The excuse that PT is not good enough is still a valid argument for many people, PT must be prioritized. The Waterview Funnel has not made my commute faster (I don’t commute to Sydney three times a week like that guy on the propaganda). On that, NZTA publicly said that reducing the speed along large sections of SH16 approaching the tunnels from either direction was unnecessary and due to public backlash they were changing it back to 100km/hr (not the tunnel section obviously). I struggle to see how this has not happened yet, especially with 110km/hr sections in Tauranga and Hamilton being rolled out so quickly. Agreed, just don’t see the tech difficulties. Solution is simple, 100km/hr max speed, when speed needs to reduce, the current electronic signage displays the reduced speed. I know this is technically possible with the current infrastructure so this is not a valid excuse in my opinion. I expect its way down their priority list, and they hope if they ignore it the problem will go away. “The importance of establishing a good public relations service should not be overlooked when embarking upon any modernization plan which alters the travel habits of the public. It is a curious but nevertheless well-known fact in transport circles that no other industry is so sensitive to or subject to such adverse criticism of any changes as the transportation of the public. These observations apply to the industry as a whole, but the criticism seems to become more intensified when the transport system is municipally or state-controlled. There is considerable conservatism to be found among users of transport, and they do abhor any change. “Every time methods of transport are altered there appears the usual spate of criticism, whether it be conveyed by letter or in person, and the only comfort a transport manager can derive in this regard is to read the newspaper files of happenings which occurred about the turn of the century and to note that the fathers and mothers of those who are now so loud in their protestations also had similar things to say when horse trams were replaced by the new-fangled electric trams for which a very gloomy future was prophesied. Ironically, that writer may have been lamenting the opposition to the removal of the trams in favour of buses and cars. Oh the irony! Increase the amount of fixed location speed cameras and have red light cameras at 1000 more intersections in Auckland. That should help a little bit towards funding too. I recall some studies on the relationship between the speed of trains and the speed of parallel road corridors. In Auckland even traffic jammed on the motorway usually moves faster than the trains. When does AT plan to have trains, or buses averaging over 70kph? The only argument for congestion taxing at present is that it could subsidise the spending needed to get AT to the stage of providing public transport able to provide for the majority of the city’s transport needs. 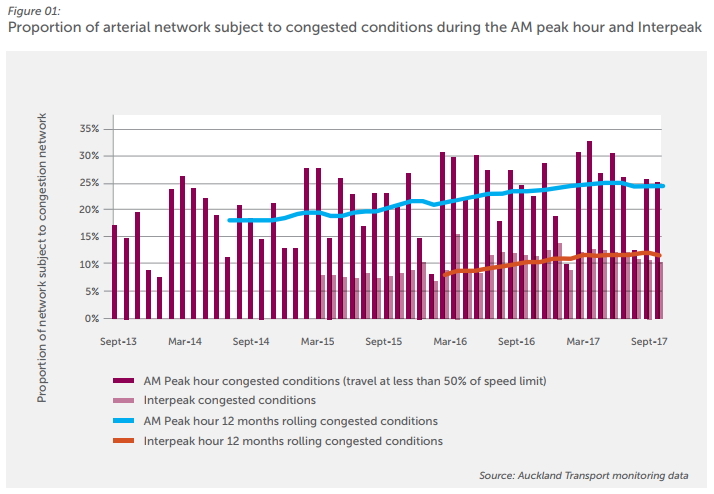 I’m pretty sure you will find the drive time between Papakura and the CBD at peak hour is routinely slower than the train, even with the current slow train speeds. I agree we need to get our trains moving much faster, however 70kmh is unrealistic unless we removed most of the stops, which would defeat the point of having the trains. no data for Papakura, but the median bus time is never faster than the median drive time from Manukau, which I find unbelievable. That’s easy to explain: If you’re going 30 km/h on a motorway it feels like terrible congestion, and is probably reported as such, but actually you’re still moving at the same average speed as the trains. I guess that I haven’t driven at peak hour in Auckland for a *loooong* time, but I would be surprised if you could get from Hobson Street to Redoubt Road in 35 minutes at peak. I agree with your comment below about regional and intercity trains though. Maybe you’re right. I don’t have recent experience. But what are they measuring then for these graphs on page 17? Now that I think of it, 35 minutes is indeed surprisingly fast. Maybe you’re on the motorway for only 35 minutes but you’re also queueing up at the ramp meter for who knows how long. My experience is only Friday’s which I believe is worse, but 100 mins Mt Wellington to Papakura was reasonably common. Haven’t done it since the new lane south of Manurewa was added though. 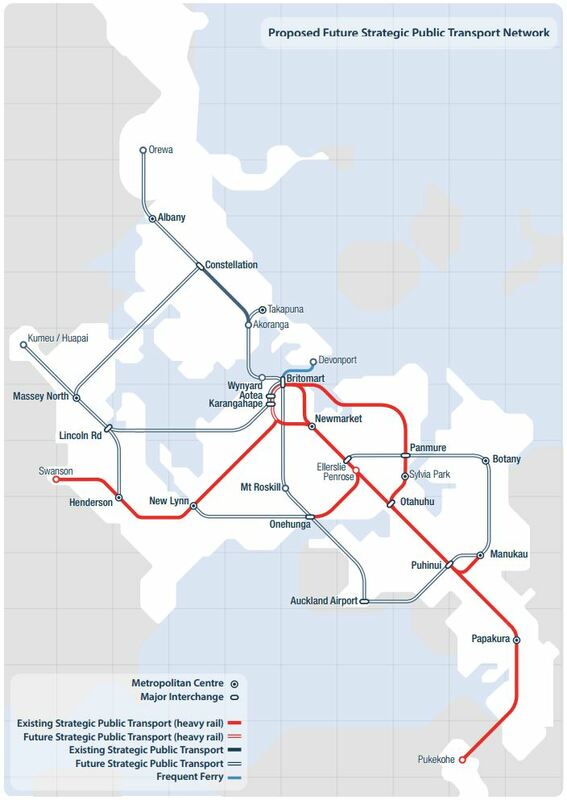 The issue is the sheer scale of Auckland, and the lack of regional trains. It’s 30 km from the city centre to Papakura. Metro trains are too slow to cover such distances. In many European cities trips of that length from a city centre to a smaller centre nearby would happen on regional trains or intercity trains. Compare eg. Brussels to Leuven, or Amsterdam to Almere. Both trips are around 30 km and can be covered by train in around half an hour. See also the CFN 2 — it shows a limited stop service to the south. London to Farnborough hants (where my sister lives) is 57km and the train averages 42min with the high speed 34min. I like Papakura and if I was working in the CBD and the train was as quick as my sister’s then a pleasant 20min reading the newspaper on the train would suit me fine. Train times and reliability seriously contribute to Auckland’s woes. My sister-in-law lives in Formby Lancs. From wikipedia: The average journey time between Liverpool Central and Formby is 29 minutes. On an average weekday, there are 96 trains per day travelling from Liverpool Central to Formby. A number of tube lines travel a similar distance if not more. Even if they retained all stops there is a lot of fat in the current timetable that could be removed. Why did we need a report to answer that? The whole point of the project is predicated on the fact that congestion pricing is the number 1 answer to doing just that. Gah.. . The language in the report is so disappointing. ATAP said “congestion pricing is a no brainer let’s do it, and do it soon”. According to the report what ATAP actually said was “maybe congestion pricing is worth thinking about, we should investigate whether we want to ever think about actual doing something. Respectfully Matt you are way too pessimistic. Remember our train patronage was growing at 17% and we coped. At off peak for a bus with 20 passengers on board a 20% increase takes it to 24 people; and 40 people goes to 48 – no issues. Even at peak we only need to add, at most one extra bus for each current five – no big deal. The biggest obstacle for AT will be their almost complete inertia and ability to achieve anything. Sorry, I have already realised I am wrong. it will be their lack of desire to want to do anything. Note that the current congestion charge in London is currently around $22. This sort of revenue in Auckland would be a great start to funding other public transport projects, but only a start. And of course if you don’t want to pay the congestion charge, don’t drive. But the London system is old and therefore unsophisticated. Simplicity does have a certain virtue but just think what a modern system could do: introduce and if the demand for PT increases to a point that it cannot meet demand then the next day just drop the congestion charge until PT can handle it. I imagine the same signs on the bridge that warn of problems ahead and temporary speed restrictions would just display the current price. If the Northern tunnel toll doubled or tripled on holidays maybe more drivers would take the hint to go via Helensville? Or increased after 4pm would persuade more holiday makers to return home earlier? PS: thanks for the data about London. Fairly sure our prices would have to be lower and the profits lower but useful info. Are you thinking we will install signs on every road to show what the price is? I imagine that would get quite expensive. Yes Bob the London system is old, but it has survived. I am not advocating this as a total solution for Auckland, but it is an easy starting point. There are plenty of options for people to access the city on public transport so this is not an impediment to its introduction. The other aspect is that if any Aucklanders are best placed to pay a congestion charge then they work in the city where wage rates are highest. environmental benefits are achieved by commencing congestion charging in the city. I agree that $22 is too hefty a charge for Auckland and maybe around $16 a day is appropriate. It is considerably less than earlybird parking rates which seem to be about $24. I don’t think there is any doubt that a city congestion charge will also free up motorways further from that area, but I also believe other steps should be implemented. There is an easy step that can be implemented at almost no cost and that is for AT to raise parking charges. An amount of $5 per day does not seem unreasonable. In many cases this will be barely noticeable, say if hourly rates changed. There is every justification for doing this because certainly in the areas where I live and work AT appears the lowest park operator. Despite AT’s apparent belief that they have a responsibility to provide cheap parking I can’t find any evidence in their operating parameters to support this. AT’s 6,000 priced city centre carparks are a small fraction of the 50,000 driving into the city centre, which are a small fraction of those driving on congested arterials. We don’t need congestion charging to sort out downtown, arguably we need it to sort out everywhere else. Nick R, you are joking surely when you say the city isn’t congested or doesn’t cause congestion? I travel from the Shore and I can assure you that most of those on the northern motorway head over the bridge towards the city. Every day as I leave the city on a RTN (not sure why its called a rapid transport network) bus I sit through three or four light changes as the bus heads towards Fanshawe St. That seems like congestion to me. I strongly suspect that city traffic has been unlocked by the price increases that private operators have made to earlybird pricing (that affects commuters). In the eight years that I have travelled to the city I have seen prices change from about $11 per day to about $24. So in simple terms prices have gone from slightly more than a three zone return ticket to almost two and a half times. That’s a very strong incentive to take the bus. But AT’s own writings say, they have not been able to reduce the number of cars entering the city in the last 10 years. Much of this will be due to those who have company supplied parking and why would they pay more to take the bus? But I do believe that AT city parking is a problem. Yes it might be a smaller proportion of the total parking, but other things being equal, if it is the cheapest it will fill first. If it is cheaper then it will also act as a brake on the market restraining prices (just like $1 supermarket bread) and encouraging driving. The evidence of Vienna is that when they raised parking prices it drove up public transport usage. As a ratepayer I am also deeply opposed to AT providing parking at below market rates. There is no benefit for Auckland in such an approach. I do agree that we need congestion charging to sort out everywhere else and you may have seen where I propose that AT increase the cost of every car park as a disincentive to drive and obviously park. What I said is we don’t need congestion charging to sort out the City Centre, not that it doesn’t have congestion. Designing proper bus lanes would be far cheaper, easier and more effective than road pricing. Yes they haven’t reduced, nor increased, the traffic to the CBD in twenty years. But they have tripled the number of people coming to the CBD in the same time. Commuter traffic, or pricing it away, is pretty much irellevant for the CBD at this point. And yes, most of the traffic crossing the bridge at peak (and by far most all day) is going elsewhere, check the stats if you don’t believe me. Given that only around 1/3rd of people who are in the City Centre each day come by car, tweaking the cost of parking, or pricing, will only have a small impact on congestion in town. It’s already a premium product for the majority of users. It’s pretty much everywhere else in the region where pricing would have effect. Having been in the back of a driving instructor’s car for 2 hours in Westgate recently, driving round and round, I’ve seen how the Hide and Ride we experience in Pt Chev is but a pale comparison to that in Westgate. It makes things dangerous for children here. In Westgate, parking has completely ruined certain streets. Taka-ite’s right – we shouldn’t be subsidising people’s parking in the cbd. But boy, the problem is much bigger than that. And until AT acts in the obvious spots like the cbd, I don’t see them doing anything to restore balance to those streets in Westgate. Head in sand stuff. i was making the point that in 2019 there won’t be a CRL. i am also skeptical that the attendees will enter the city via joining the rail link at Puhinui, or wherever it is and come that way. I intend to lodge an OIA to see what transport management plans have been lodged by the convention centre. “But they have tripled the number of people coming to the CBD in the same time.” I am assuming that you are referring to AT. i completely agree that the number of people entering the CBD may have tripled, but I cannot accept that there is a direct correlation to better services. I am utterly convinced that the huge escalation in parking costs has been a substantial driver of the change. Neither am I convinced that adding bus lanes will be a significant driver of future patronage. As an example, the journey home on the NEX can sometime be tortuous with blockages on Quay and Fanshawe and then on the bridge. Despite that patronage has grown at over 15% annually. Will freeing those points drive significant growth? Like many posters on this blog I see a city with light rail on Queen St, a Victoria St linear park, more bus lanes and more bike lanes. In my view all of this will only be possible by inducing less people to want to drive into the city and congestion pricing is a model to achieve it. I suspect mostly that you and I have a very different vision of what the city should look like in five or ten years time. I see that the current figure of only 90 million public transport trips per year is appalling. Compared with the likes of Vienna where the default mode for transport is public transport and where there are 950 million trips per year we have not even scratched the surface. That city has a real commitment to achieving carbon emission goals, reducing non environmentally friendly trips; and they have also realized the economic benefits for the population without car ownership. I absolutely agree that change should happen across the city, but that it should start first in the city because that will be easiest. Slightly off topic but still related – I drove to the car park in Wellington Airport yesterday and as I went through the barrier arms, got my ticket thingy, and was amazed to find the machine had printed my Rego number on the ticket. Coming back later, I’d paid my fee, and as I was going to the exit gates, the barrier arm went up and the message said “You’re good to go”. Not sure if this old news to some, but it was a brand new experience to me – evidently rego number scanning and so effectively road pricing (in this case a static, parked road), all at no cost and no fuss. Seemed good to me. You got this in Auckland ? Number plate scanning is no big deal, our toll roads already do that. Its not at no cost however, the systems are expensive. The northern gateway toll road uses something like 40% of it’s revenue paying for the revenue collecting system. That would go down the wider the system, but it does require a whole lot of cameras and gantries and back end systems. For an elaborate cordon scheme the number of camera sites could run into the hundreds. In Brazil they have a system where you can place a recognition card/sticker on your windscreen and your account is charged for tolls. In Sao Paulo there are points that you pass on the motorway where you pay a toll. You travel another 10kms say and you pay another toll. The more you travel the more you pay. It would seem a reasonable step here to build that recognition system into car registration /wof system. For example, at the time of registration you might prepay $100 and subsequent tolls are debited against that. Or you might choose to run an account and top up like with HOP. In any event if a person owes money for their tolls they should be prevented from registering /transferring ownership until the debt is cleared. I’m finding the report somewhat annoying to read. The lesson they are taking from Singapore is to start with a simple scheme and work your way to a GNSS TDP system. But Singapore didn’t do this in 2018, it started in 1975. The lesson of Singapore is that they are adopting better technology to allow a more sophisticated scheme as early as possible. They also jump straight to discounts or exemptions for poor people most affected. Why would they say that. Surely cash transfers are the best option to avoid undermining the system. Actually now I’ve read the report I think I can see what they are angling at. They are effectively saying developing a project over 10 years is too long as politicians will come and go. It seems like they are saying we should move to get a simple scheme implemented within 2-3 years. That does make some sense given our election cycles etc. Making better use of the road network by making peak hour longer and longer doesn’t reduce carbon emissions or pollution. Encouraging more traffic at times of day when the cars can flow faster doesn’t reduce pedestrian and cyclist accidents. Road pricing to encourage an under-active / overweight driver to drive at a different time of day doesn’t improve that person’s health or reduce the cost on the health budget. Sure, we can “get more out of the road network” – but let’s look at what that means. What will the people do who can afford to pay the road pricing charges under a less congested road environment? They’ll do what research shows they’ll do under any less congested road environment: They’ll drive more. It’s just another form of induced traffic. Unless someone can show me otherwise, I’ve come to the conclusion that road pricing could at best be one minor tool in a far more impressive list of transport policy changes. I want to see the others first: massive increase in tax spend on and road reallocation to public and active transport mode infrastructure. Our current transport spending philosophy is dominated by chasing the elusive goal of congestion relief. If we use road pricing to relieve congestion this pressure to spend huge sums of money on road expansion is reduced. Transport planing is also dominated by avoiding making congestion worse. On-road PT (eg bus lanes) and cycling projects are constantly being compromised because reducing road space for cars would cause more congestion. Road pricing will allow us to decide what we want to do with scarce road space without traffic engineers yelling “computer says no!”. Yes, thanks for the thoughtful reply. As a minor tool within a progressive suite of major changes to policy, it’ll work. As a long-awaited relief which in effect allows continuation of the same cars-come-first planning we’ve had to date, it’ll be a disaster. Yes exactly, 8-). Several economists have pointed out that it is very hard to decrease congestion unless the cost is extremely high, because congestion is part of the price. Reduced cars on the road promotes more cars. Induced demand is huge. Politically it is hard to increase charges enough, because wealthy people are effective lobbyists, drive more than poor people, and surprisingly resent being charged, 8-). I respectfully submit that right action is to to _maximise_ congestion for cars and reduce it for transit and bicycles. We want less cars and less driving. Congestion helps both goals. 1/ The NZTA must accept it has been wrong with its modelling. When modelling a new or widened road, they do not model that there will be new trips created because of that road. They say: “newly created trips are the least likely response to new infrastructure.” This is blatantly and egregiously wrong; and flies in the face of international research such as Duranton and Turner. The result of this inaccuracy in their modelling has been inflated BCRs for new roads, feeding poor information into transport decisions. 2/ The ministry and transport authorities must provide comprehensive public education about how road building has created the congestion problems we have, and how public transport, active mode infrastructure, and road contraction are the solution. 3/ The government and AT must provide funding directly from taxes and rates to improve public and active transport infrastructure, reallocating road space to do so. A more complete “road charging” system can then follow to place the multiple costs that driving impose on society at the door of the people driving. But, for reasons of equity, this can only proceed after the public and active transport infrastructure has been radically improved, so that no-one is required to drive to have access to their city. Fallacies such as the quote that I started this comment with do not help in moving either public servants or the public towards understanding the underlying causes of our problems, nor towards grasping the most cost-effective and life-enhancing solutions available to us.